We're havin' a heatwave, a tropical heatwave. In the middle of Paris. It feels more like we're in the middle of Rio de Janeiro, frankly, though that might also be the effect of the Carnaval Parade dancing its way through our neighborhood. Some of the skimpier outfits seem appropriate, even on the streets of Paris, when the thermometer hits 40°C -- 104°F, that is. If only it weren't for all those hot feathers, I might start walking around Paris like this, too. How are they surviving their full-body costumes? They're surviving because the organizers regularly force water and dance/shade breaks on the participants. It's so hot that even the half-naked tropical flowers are wilting. It's actually a little hard to tell this Carnaval Parade apart from the Gay Pride Parade that happened just the day before (and, I should tell you, Carnaval is the bigger deal here). Between the rainbows, the heels, and the costumes, it's really not that different. Just hotter. It's so hot ("how hot is it? "), there are no performers and almost no tourists on our bridge, which on a gorgeous summer day would normally be packed. This is not just because they're at the Carnaval Parade. Even in the following days of the extended "canicule" ("heat-wave", that is), our bridge remains empty until both darkness and the temperature fall. Where are they if not on our bridge? They are all, as far as we can tell, wilting in some café or crowding around the refrigerator aisles in the supermarket, trying to keep cool. It's hard to be in a heat-wave in a place that doesn't normally need air conditioning because -- guess what? -- most places honestly don't have air conditioning (I know, this is very French to not have something you don't need, as opposed to the US, where you would have it just because it's the thing to have). Even the sorts of stores, shopping centers, and buildings that would, in the US, require you to put on your winter parka in July, are only slightly cooler than outdoors, at best. There's simply not much relief. You walk inside, outside, it's all the same: hot. When we've got more time, and enough get up and go to actually get up and go somewhere, we hit some of our local Paris pools, and the ever-popular Parc André Citroen, with its deliciously cold fountains. Gigi goes with a friend to a bigger suburban pool, but the line is so long, they're only letting in the elderly, handicapped, and local residents in limited numbers. I feel like moving into my shower and setting up residence. Or my freezer. For the end-of-school (both end-of-school-year and end-of-elementary-school) field trip, not only do we try to find as much shade as possible, but also the children fully arm themselves for an all-out water battle. Sadly, as always when the kids break out the guns, my children and I have the conversation about how this would almost certainly not be allowed anywhere in American schools - kids shooting each other like this. The French perspective is that they'd much rather let their children (and citizens) have water guns that real guns. Amazingly, this heat doesn't preclude the kids from going to school (primary school in session through July 3rd!) or doing their after-school activities. Despite the fact that no -- of course, not -- the gym isn't air conditioned and it's essentially built like a greenhouse, gymnastics continues, business as usual. It's a serious heat-wave with reports of roads buckling, people fainting, deaths by both heat and drowning. We haven't been hit that hard, but nights are rough; we have to spray the children at regular intervals in order for them to be able to fall asleep. Sadly, there is nobody here to spray me and Anthony at bedtime -- or throughout the night. We wake up constantly to play with the windows and shutters, or sprinkle ourselves with water, expecting a cool breeze to come in from outside that never comes. To quote another song: It's too darn hot. It's too darn hot. 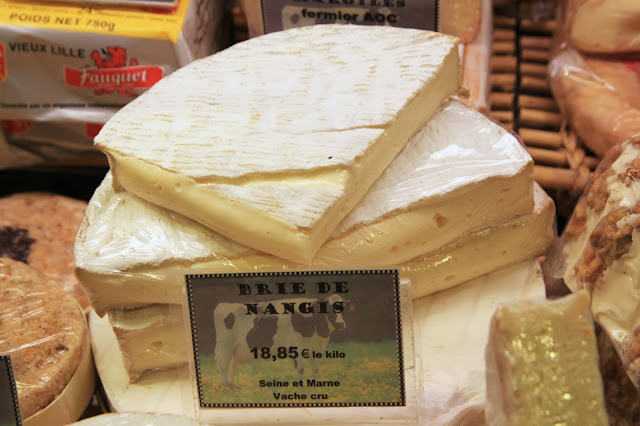 Brie de Nangis, a close sister to Brie de Meaux (one might even call them twins), is a raw cows' milk Brie made in all seasons in Seine-et-Marne in the Ile-de-France region. 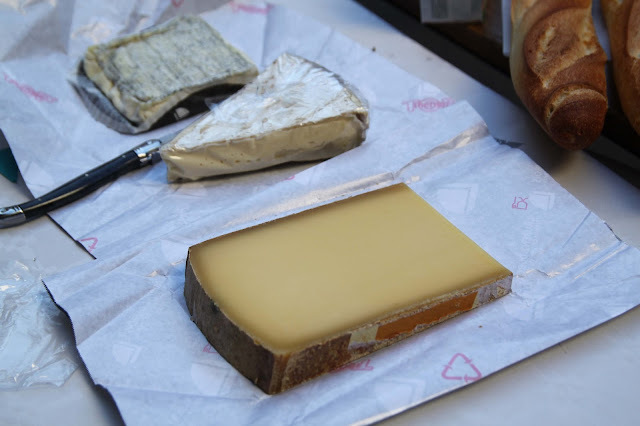 Aged for four-five weeks, the flavor is slightly stronger than Brie de Meaux (also aged around a month), but in pretty much every other respect, they are alike: that golden, buttery flavor. That oozing creaminess inside the white-bloom crust with reddish-brown peeking through the striations. 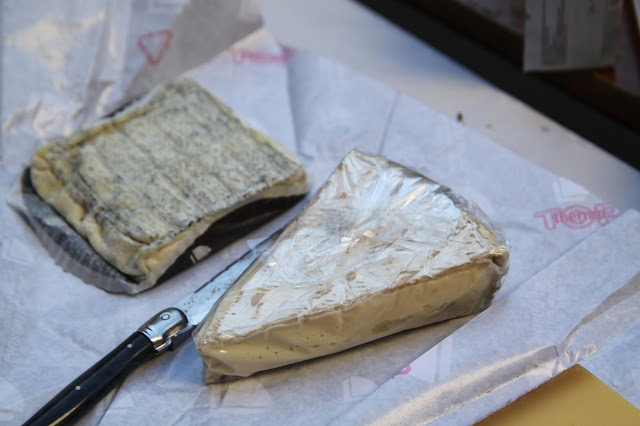 The cheese is named after Nangis, where it was invented, though not where it's currently made, which is Tournan-en-Brie. If there were ever a cheese you really don't want to set out at the table during a 100°F / 40°C heat-wave, it would have to be Brie. And yet, that is what comes out at the end-of-school boum (school dance) for the graduating 5th graders. I have what feels like a split-second to photograph it, even straight from the fridge, before this heat gets it oozing, amoeba-like, all over the platter. It's so liquid, it's actually hard to get on the knife and onto the bread. On the other hand, Mother Nature's fondue is still delicious, so perhaps you just need to serve it with a spoon. And, if you must know, I am actually not the one to bring cheese to the party (the locals request that I bring in American chocolate chip cookies). The other cheese on the platter that doesn't do well in the heat is the Comté. Upon further reflection, perhaps this is the sort of cheese you really don't want to set out at the table during a 100°F / 40°C heat-wave. Like one of the boys trying to work up the courage to dance at their first boum (it never happened), the cheese gets sweaty and clammy in the heat. It loses that delicious crumbly dry texture and feels, instead, oily and mushy. Tip for your next heat-wave cheese platter: avoid the hard cheeses. If you really must serve cheese during a 100°F / 40°C heat-wave, the best option soft goat or sheep cheeses (and of those, I would say goat). These are cheeses that are made in sunny, Southern spots, and just seem to go with the Mediterranean heat. Yes, they too may get runny, but the flavor seems somehow lighter, lemonier, and just right for naturally-melted cheese for unnaturally-melting people.